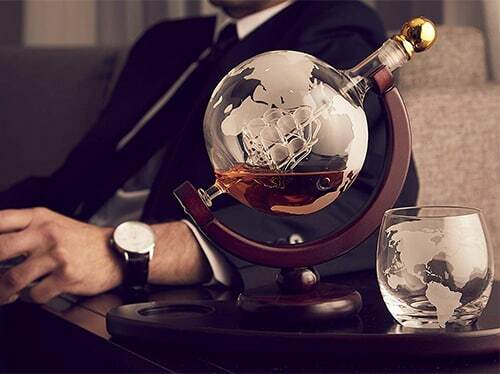 • Hand Blown elegant Whiskey Decanter dispenser featuring an etched globe design and antique ship in the bottle will undoubtedly enhance your drinking experience while making a bold impression. • PATENT PENDING set includes whisky decanter with 2 matching globe design old fashioned whiskey glasses fitted onto mahogany stained tray. Gold stopper adds a touch of class while keeping your spirits sealed. • Great conversation piece at any party. Can also be used to serve water, juice, Soda, iced tea and other beverages.